At last Samsung's new smartphone Galaxy S4 launched in India for Rs. 41,500 INR. It come with 5 inch capacitive AMOLED touchscreen with 1080 x 1920 pixel screen resolution and 16 Million colors. It runs on Google's Android v4.2 Jelly Bean OS and this smartphone powered by 1.6 GHz octa core processor that mounted on Exynos 5 Octa 5410 chipset. For easy multi tasking it built in with 2 GB RAM and PowerVR SGX 544MP3 GPU available for best graphics performance. Dimension of the smartphone is 136.6 x 69.8 x 7.9 mm and 130 gm weight. 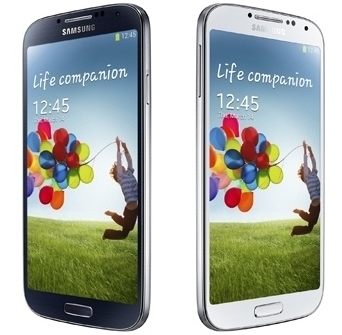 Galaxy S4 available in three memory variants 16/32/ and 64 GB. And external memory support up to 64 GB via MicroSD card slot. Samsung Galaxy S4 sports dual cameras, 13 Megapixel rear facing camera and 2 Megapixel front facing camera with video calling facility. For smooth web browsing it come loaded with HTML5 browser with Adobe Flash on it. For connectivity needs it has GPRS, Wi-Fi, 3G, Bluetooth, USB, and GPS connectivity features. The device built in with 2,600 mAh rechargeable battery. Thank u 4 sharing this!